Tank is a 9 month old, Bi-Colored GSD. He is now about 85# and a lean mean working Machine. He has been working on his personal protection training with Ultimate Protection K-9 Training Club in Chilhowie Va. He completed his CGC with flying colors. Tank was born with a deformed tail, it was doubled back and the bone was fused which ultimately had to be docked.. but that does not slow him down..
What a handsome boy your Tank is - I love his coloration. He looks a lot like my newest GSD, Rodie - they could be brothers! He sounds like he is well on his way training wise and I wish you a lot of luck with him. Please keep us informed on his progress - that little guy has a long life ahead of him. Your German Shepherd puppy is handsome and intelligent and a wonderful member of the breed. He will develop into a fine young man and a wonderful German Shepherd adult. Congratulations! Tank is a handsome boy, tail or no tail! Tank is a Beautiful Shepherd! 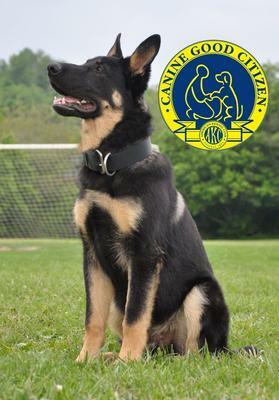 He is exceeding in his K-9 training and will be an asset to the community where he is serving. Tank - Top Dog! Take care of your boy and he will always take care of you!